How was iPhone X pre-order day for you? It was very, very good for Apple - says Apple - with customer demand "off the charts" according to an official statement. Delivery dates for the high-end, bezel-free phone have now been pushed back to December, though you could always overpay on eBay. "We're working hard to get this revolutionary new product into the hands of every customer who wants one, as quickly as possible," says Apple, as 9to5Mac reports. Pre-orders went live on Friday morning but whatever initial stock there was seems to have quickly been snapped up. 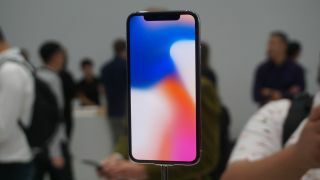 The other option for getting your hands on Apple's latest and greatest (and most expensive) handset is to walk into an Apple Store on November 3 - Apple will have some units in stock, it says, but advises interested punters to turn up early. Meanwhile, despite the apparently low stock levels, some customers are seeing improvements in their delivery times, MacRumors reports. A handful of readers saw delivery dates brought forward from November 10-17 to November 3. If you have managed to get your name down for the iPhone X then, it might show up a little earlier than you reckoned, so adjust your plans for booking time off work accordingly. If you haven't already got a pre-order in, it looks like you'll have to wait until December at least if you order now. We won't know for sure how many iPhone X units Apple has shifted until the company announces its financial results for the quarter on November 2. In the meantime don't forget there are plenty of phones out there if you're shopping on a budget.